Seasons of Life. There are so many busy seasons in life: When your spouse and the kids are clamoring for all of your attention; when you’re focused on your career or business; when the storms come and you are focused on an illness, financial crisis, or heartbreak. How does your relationship with God look during these times? 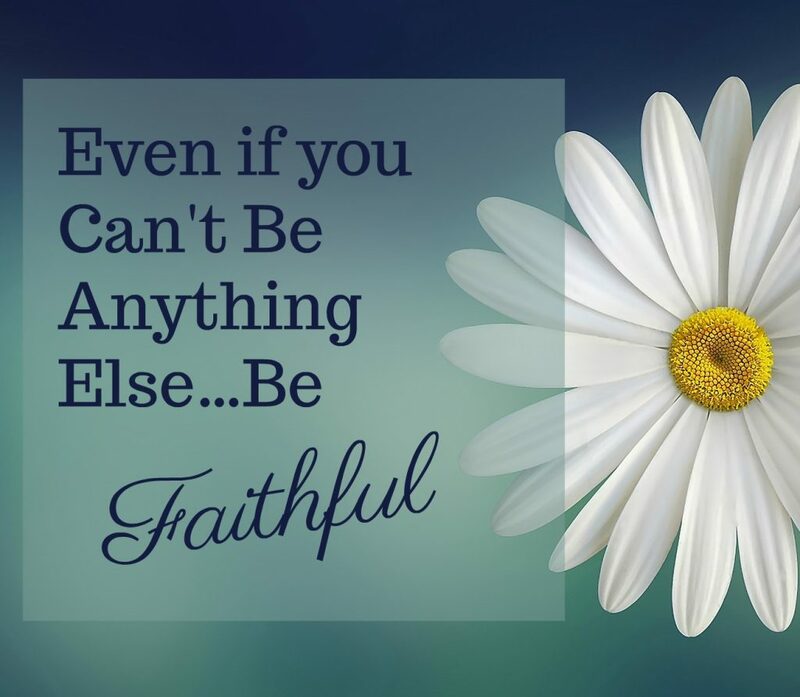 When I find myself in these seasons where my time, talents, or energy is in short supply, there is always one thing I try to remember: Even if you can’t be anything else, be faithful! Sometimes this is literally my mantra. It’s often all that keeps me motivated to stay faithful in my relationship with my Heavenly Father. Not that I’m speaking about leaving my salvation behind, but in keeping my head in the game, so to speak. To keep the communication going, to keep Him as my main focus. I’ve been contemplating this idea of being faithful quite a bit lately. Honestly, our relationship with God is often the first thing we neglect when we get into that busy or overwhelmed mode. After some study, I realized that if I’m not on guard, the following areas are easy for me to neglect. I’m also sharing some verses as reminders and encouragement for you if you find yourself in a busy season. Even though I’m not in one of my busiest seasons right now, just yesterday I breathed this prayer, “Heavenly Father, please forgive me for not spending time in conversation with you today.” I had realized, towards the end of the day, that I had been so focused on the tasks that I was working on, that I had spent very little time in prayer. And I missed it! One thing that I love about prayer is you can literally do it anytime, anywhere, during any activity. 1 Thessalonians 5:17 ~ Pray without ceasing. Bible study is another area that I find it easy to slip in. Once my day gets started, it’s often “Full Speed Ahead” and if I haven’t spent time in the Bible early in the day, it’s not likely to happen at all. I found that doing a short devotional in the morning before my day really starts helps me to stay on track with my Bible Study time. This is a great time of communication between you and God, and it never pays to miss out on it! 1 Timothy 4:13 ~ Till I come, give attendance to reading, to exhortation, to doctrine. Psalms 1:2 ~ But his delight is in the law of the LORD; and in his law doth he meditate day and night. 2 Timothy 2:15 ~ Study to shew thyself approved unto God, a workman that needeth not to be ashamed, rightly dividing the word of truth. Honestly, one of the most tempting areas to neglect is church attendance. Missing Sunday Morning services can gain you an automatic two to four hours of “free” time. But I do believe that missing out on church services is really to our detriment. We need that time with other believers. It’s a time where we can encourage each other, spend time in the Word, and be fed by the Holy Spirit through preaching and teaching! I have often regretted NOT going to church, but can’t recall a time where I regretted going even if I didn’t feel like it. Hebrews 10:25 ~ Not forsaking the assembling of ourselves together, as the manner of some is; but exhorting one another: and so much the more, as ye see the day approaching. 1 Corinthians 12:12 ~ For as the body is one, and hath many members, and all the members of that one body, being many, are one body: so also is Christ. Hebrews 3:13 ~ But exhort one another daily, while it is called To day; lest any of you be hardened through the deceitfulness of sin. Stewardship covers so much! Everything belongs to God, so we should be giving everything back to Him. Whether it is our money, time, talents or things, we should use them to glorify God, and be willing to allow Him to use those things through us to bless others. If you have a talent, use it. If you have money, give it. If you have time, share it. It doesn’t have to be a grand gesture, but make the gesture meaningful, no matter how much (or little) you have to give. I can tell you this, I have seen miracles of fishes and loaves when I gave when I thought I had nothing to give, and found I had more than I had before I gave. God truly does give the increase! Psalm 24:1 ~ The earth is the Lord’s, and the fulness thereof; the world, and they that dwell therein. Luke 6:38 ~ Give, and it shall be given unto you; good measure, pressed down, and shaken together, and running over, shall men give into your bosom. For with the same measure that ye mete withal it shall be measured to you again. Proverbs 19:17 ~ He that hath pity upon the poor lendeth unto the LORD; and that which he hath given will he pay him again. 1 Corinthians 15:58 ~ Therefore, my beloved brethren, be ye stedfast, unmoveable, always abounding in the work of the Lord, forasmuch as ye know that your labour is not in vain in the Lord. I truly hope these thoughts and verses will be a blessing to you if you find yourself in a busy, difficult, or overwhelming season! Make sure you don't miss any posts! 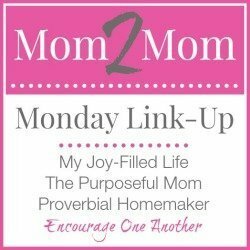 Sign up now for email updates from Christian Mom at Work!